City DPRD's Commission C asks eight BUMDs that are proposing regional capital investment (PMD) funds to prioritize the uptake for public welfare programs.
" 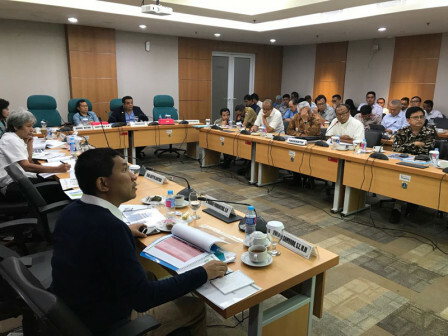 My hope is that PMD can be given more to the public welfare program"
"My hope is that PMD can be given more to the public welfare program," expressed Santoso, Chairman of City DPRD's Commission C, Monday (8/13). Those eight BUMDs are PT Jakpro, PT MRT Jakarta, PT Food Station Tjipinang Jaya, PD Sarana Jaya, PDAM Jaya, PD PAL Jaya, PD Dharma Jaya, and Perumda Pasar Jaya. He mentioned that the total proposal for PMD funds submitted in the 2018 Amendment APBD is Rp 11,015 trillion. The need for PMD funds has been explained by each BUMD in a work meeting at Commission C today. "The public welfare programs can be done. For instance is the construction of a zero down-payment housing project or a flat," he explained. With PMD funds, he assessed, BUMDs in the infrastructure sector are believed to be able to implement land bank programs to make it easier for the government to realize housing needs for residents. "They (PMD) must focus on profit oriented and social oriented," he said.